The American Human: Do White Nationalists Deserve a "Seat at the Table?" Ross Douthat Thinks So. Do White Nationalists Deserve a "Seat at the Table?" Ross Douthat Thinks So. Donald Trump didn't create an era of white nationalism. He just discovered that white racists are out there waiting to be used politically, just as Nixon realized the South could be used as a block to underpin Republicanism, which is now Conservationism 101. But give white nationalists a seat at the table? You've got to be shitholing me. far behind? Or is it deeply American to be aggrieved at brown people? Maybe so, or definitely so? I'm thinking definitely so, and that's not good. But liberals have been waiting 12 years for that “eventually” to arrive, and instead Trump is president and the illegal immigrants they want to protect are still in limbo. So maybe it would be worth trying to actually negotiate with Stephen Miller, rather than telling Trump that he needs to lock his adviser in a filing cabinet, slap on a “beware of leopard” sign, and hustle out to the Rose Garden to sign whatever Durbin and Graham have hashed out. Now, the least funny part of this view isn't that, as usual, liberals could solve a lot of problems if, I don't know, they'd be more conservative. No, the least funny part of this is that letting Stephen Miller have a "seat at the table" is like saying that Hitler would make a seriously bad president but could maybe not ruin the world as secretary of state. Of course, I just violated somebody's view of journalism that if you bring Hitler into it you've already lost the argument, especially because, it turns out, Stephen Miller is now being referred to as an "un-Jewish" Jew. Who knew that this descendant of immigrants -- as nearly all Americans are -- would become the Trump administration's face of white nationalism (when his boss isn't playing the lead role)? 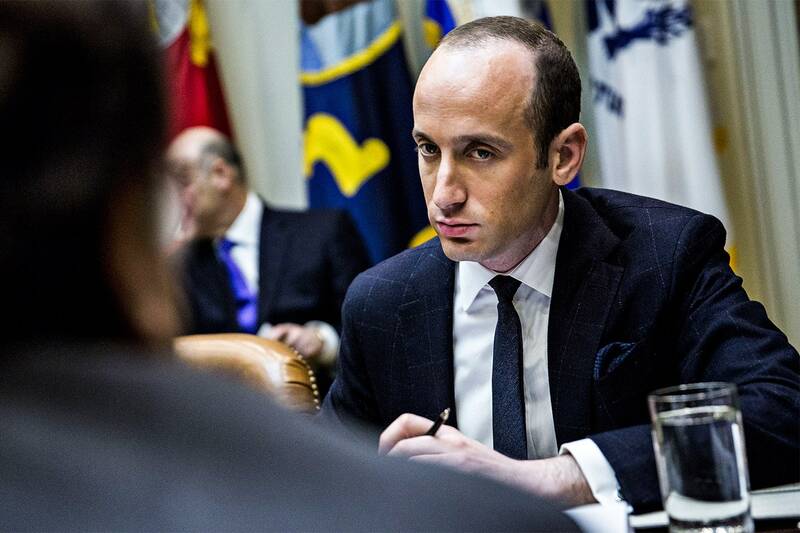 But there's no escaping that Stephen Miller has bulled his way into the heat of the immigration battle with clear Nazi overtones to his rhetoric (oops, broke rule number two). Why would I label him so? First, because his waving of the white-nationalist flag has earned him such derision, and second, there's only a qualitative difference between concentration camps and not letting "the others" into the country in the first place. Also, I'm not trying to win an argument. I'm just trying to buttress the view that Stephen Miller doesn't deserve a place in it. And he doesn't, unless you subscribe to the notion that being exclusionary, especially of people from shithole countries, is quintessentially American. If you do, you agree with Ross Douthat, and should go sit at a table with him.